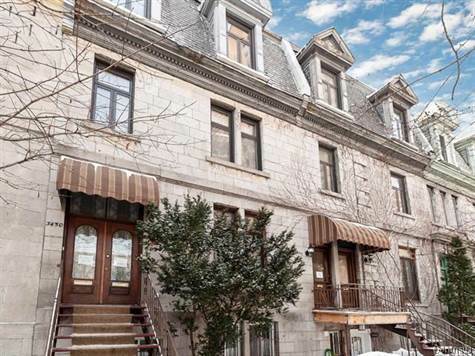 Magnificent large spacious 2 story Plateau apartment featuring architectural details, beautiful moldings, high ceilings, hardwood floors and much more! 3 Bedrooms, 3 Bathrooms (2 ensuite), large private Terrace, and parking. Ideal central location close to restaurants, shopping, universities, and hospitals. Beautifully furnished! Refrigerator, Stove, Dishwasher, Microwave, Washer, Dryer. Furniture, Light Fixtures, Drapery, Blinds. Hydro, heat, telephone, cable, internet, snow removal.